Do I Need a Vapor Barrier in My Shed? When building a shed, there are many things to consider in the planning stage. What kind of floor do you want? Is your shed going to be heated and air-conditioned? What kind of moisture barrier for shed walls do you want? The list goes on. However, the last question about a moisture barrier is the one I’m going to address in this article. Do I need a vapor barrier in my shed? A shed without heat and air-conditioning does not need to have a moisture barrier as it will cause condensation and mold growth. If you plan to build your shed on a concrete floor, a plastic barrier under the slab will prevent moisture from entering through the concrete. In this article, I’ll explain what a vapor barrier is and when you need to have it in your shed. What is the Purpose of a Vapor Barrier? What Kind of Plastic Do You Use for a Vapor Barrier? Related Searches: Is House Wrap Considered a Vapor Barrier? A vapor barrier is a non-permeable plastic that prevents air flow through a structure. It prevents moisture from causing rot and mold inside the walls and ceiling. In cold weather, climate condensation occurs when warm air meets cold, and forms water beads. The vapor barrier should be on the inside of the framing. It prevents moisture inside the shed from getting into the insulation. Moisture in the insulation can cause rot and mold, and also lowers its R-value. In a hot, humid climate where you air-condition your shed, condensation occurs when the hot air meets the cool air. A vapor barrier on the outside of the framing prevents the hot, humid airflow into the cool air zone. If you insulate and air-condition your shed, put the vapor barrier on the outside of the walls. It will prevent moisture from entering the shed and causing mold and rot. Any moisture that does enter will be absorbed by the drier cooler air inside the shed. The air exchange system will then expel the moisture out of the building. If you use your shed year around as a workspace, you need to insulate and heat it. The vapor barrier should be on the inside of the framing. It will protect the insulation and wooden frame from the warm moist air inside the shed. Moisture that may enter the walls in the summer should be absorbed by the outside air when the temperature cools at night. A shed that has no insulation and is not heated or air-conditioned shouldn’t have a vapor barrier. The air flows through the shed causing moisture to build up inside due to superheating of the air inside the shed in summer. However, the air flow through the shed at night will also remove the moisture from the shed when drier air passes through. Ensure the shed is properly ventilated. If you want to insulate a shed that won’t be heated or air-conditioned, you’re better off not using a vapor barrier. The insulation slows heat transfer in or out, but the inside of the shed will still heat up in the summer. Without a moisture barrier, the airflow through the walls at night will remove moisture which plastic would otherwise trap. If you’re concerned about the possibility of mold or rot, use rock-wool insulation or rigid insulation. It is also important to have proper ventilation in your shed to permit warm moist air to escape the structure. 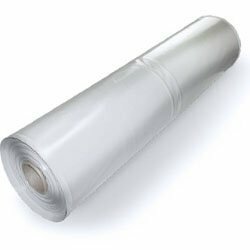 The industry standard since the 1960s for a vapor barrier has been 6-mil (6/1000 of an inch) clear polyethylene plastic. However, studies have shown that it is susceptible to tears and is permeable to moisture. A minimum thickness of 10-mil polyethylene is recommended. It is stronger and will permit less moisture permeating through it. Plastic Poly Sheeting True 10 Mil is available o Amazon if you are interested. In a heated shed in a cold climate, the moisture barrier should go on the inside of the framing. Place the plastic on the outside of the building for an air-conditioned shed in a hot, humid climate. Sheds that have 6 or more inches of air flow under them shouldn’t need a vapor barrier underneath. The air flow should keep the understructure dry. If you enclose the space between the ground and your shed, then a moisture barrier is advisable between the plywood floor and the joists. Make sure you install vents to permit the air to circulate and keep the cavity dry. It is also advisable to use ¾” pressure-treated plywood for the shed floor. It will help prevent moisture from damaging the floor. If you plan to pour a concrete slab upon which to build or place your shed, I recommend you put down a 20 mil vapor barrier. The thicker polyethylene-polyester blend is much less permeable to moisture than the 6 mil. It is also more resistant to tearing and puncturing as you pour the concrete, even if a rebar grid sits on it. The 20 mil poly under the concrete forms a moisture barrier between the ground and the concrete. It will prevent the concrete from curing too quickly. It also prevents ground moisture from being drawn up through the concrete into your shed. Always use a sill membrane to protect wood framing from moisture on a concrete slab. If placing a shed with skids on a concrete slab, do NOT put poly down between the skids and the concrete. The plastic will cause the wood to rot. There should be at least 6 inches of clearance for ventilation under the shed to remove moisture. Wood sitting on the ground will rot more quickly than wood on gravel. A gravel pad will create a capillary break between the ground and the shed. Make sure you have space between the floor and gravel to allow proper ventilation. The gravel pad should be 4” to 6” thick and of clean ¾” crushed stone without any particles, or pea gravel. The gravel also creates a drain pad which allows any ground moisture and gasses to dissipate. Adding a 10 mil to 20 mil poly sheet between the ground and the gravel will create a vapor barrier. You should only use a vapor barrier if you plan to heat or air-condition your shed. There should always be proper ventilation between the ground and the shed floor. The moisture barrier should be between the joists and plywood floor. That will permit any moisture to drain into the gravel under the shed and not settle into the insulation. Your shed does not need moisture or vapor barrier unless you plan to heat or cool it. The plastic should be 6 mil poly, but 10 mil to 20 mil is better. If you heat your shed, the barrier goes on the inside of the wooden frame. If you cool your shed, the moisture barrier goes on the outside of the building. I’ve done a lot of research on this one. Academics and master builders seem to agree on only one thing; all attics need an air barrier, but not a vapor barrier…depending on your climate. Cold climates with a vented attic should have a vapor barrier. Most others should use a vapor retarder like MemBrain, latex paint, or some other permeable membrane. All attics should be vented…except in hot, humid climates where the air barrier should be on the outside of the structural shell. Hot, dry climates should be vented, and the air barrier also on the outside. The walls of a plastic shed don’t need a vapor barrier. If you have a moisture problem, consider installing passive or active vents near the roof. The floor structure of a plastic shed can have 10 to 20 mil vapor barriers under the gravel it sits on. Alternatively, if it sits on patio stones that sit on the sand, the plastic barrier goes under the sand to prevent moisture from migrating up into the shed from the ground. A house wrap like Tyvek is not considered a vapor barrier. It is a permeable material that goes on the outside of a building. It is water resistant, but not vapor resistant. It breathes so that vapor will pass through it into, or out of, the building. If i am building a timber shed with a corrigated metal roof do i need a vapour barrier in the roof? Are you planning to insulate your shed? If not then you don’t need a vapor barrier.